David De Gea produced a moment of excellence once again for Manchester United this afternoon, the Spaniard stopped Jamie Vardy’s acrobatic effort from going in. 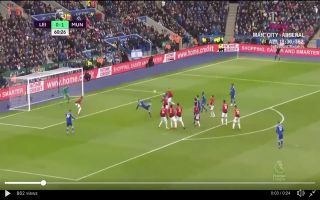 In the 60th minute of the tie James Maddison’s free-kick was deflected over the wall and former England international Vardy hit a sweet bicycle kick towards goal. Fortunately De Gea wasn’t duped by the deflection giving him enough time to push away Vardy’s effort, the Spaniard even managed to gather the ball before it could be tapped in. United’s No.1 quite literally has all hands on deck.